You really must give it to the Malayalis, the people of the south Indian monsoon rich green state of Kerala, who speak the language, Malayalam. (Yes, it is Malayalam, not Keralan). How else can a community go against the prevailing norms relating to celebrations and spin its own unique story that lends credence to the legend behind Thiruvonam? Before we get into the tale, let us define the context for the benefit of non-Malayalis. Thiruvonam, regarded as a harvest festival, is being celebrated on September 4. That is the day you could see people from Kerala walk around in Dubai (or for that matter, anywhere in your neighbourhood, anywhere in the world) in their spotless white mundu with golden embroidery, and women joining them, decked up in kasavu sari (the hand-woven cream-coloured sari with golden embroidered edges). That is day they will have their sumptuous feast spread out on banana leaves (imported from Oman), the delicacies giving Pantone-obsessed designers a run for their money. From yellow to red, brown to green, and white to black, the delicacies come in all colours, in addition to a pinch of salt (literally) as garnish. They will wrap up the feast with several payasams (a rare version of sweet pudding meets running dessert), and if you happen to pass by a club or association premises, you will see them engaged in tug of war competitions. Look around, you can see floral patterns made on the floors – a traditional activity that is a must for Onam, starting nine days earlier and culminating with the largest floral decoration on Thiruvonam day, the 10th and main day of the Onam festival. Prior to the feast, there would be a procession replete with traditional musical instruments, and you will not miss the rather paunch-heavy man with a crown and a palm-leaf umbrella being obsequiously welcomed by one and all. You can watch him nod his head, and look around with absolute tenderness. That is King Mahabali – Malayalis’ own Santa. And this parade of festivity, which falls on Thiruvonam day as per the Malayalam calendar, is to welcome him. That in nutshell is the festival of Onam. So, let us go back in time. We are stepping into a world where myth meets belief, legend meets creative story-telling, and philosophy meets wisdom. We are going into the heart of characters, who are in the grey area of perhaps a little substance liberally garnished in fable and folklore. Welcome then, to the land of King Mahabali – a demon king. If you are wondering why a demon is king, we must go even further back into the divide that prevailed according to the Maha Puranas (great histories) of India. There were the Devas, the good lords who lived somewhere up in heaven, who were forever running in fear of the Asuras, the bad demons who dwelled on land and possibly underneath too. Caught between them were the ordinary mortals. But in a land of plenty, which Malayalis believe is Kerala, the ruling demon was anything but bad. He was, as our new generation kids say, ‘like the best.’ He was also of great lineage tracing all the way back to some of the pious and benevolent rules of ancient (mythical) India. Everyone was equal. There was no deceit, no exploitation, no petty thieving, no falsehood, not even an iota of dishonesty. It is classic Utopia where everything was perfect and everything was in abundance. The people rejoiced under the benevolence of their king. Since Mahabali was a demon, of course it was up to the Devas to feel insecure seeing all this heaven-like happiness on mere Earth. Mahabali had also become so powerful he seized the heavens from its lord, Indra. The Devas, as usual, went crying to the Supreme Power. But in the bigger scheme of things, the Supreme Power, who take avatars (incarnations) had clear plans of being on Earth. He was born as a diminutive man named Vamana, and arrived to meet Mahabali while he was busy performing a great sacrifice. It was customary that guests be treated with utmost courtesy and asked whatever they wanted. After an intense philosophical discourse that is mentioned in Canto 8 of Bhagavata, one of the 18 Maha Puranas, Vamana asked for but three ‘steps of land.’ Request granted from Mahabali, Vamana took to task but only after he suddenly grew in stature, towering high and mighty. With the first step, he occupied the entire ‘surface of Bali’s world’ (including of course Kerala) and with the second the entire outer space. And here comes perhaps the most interesting anecdote on Mahabali that is relevant any day. (Pity the message is lost in all the current gaiety). In Chapter 21 of Canto 8, curiously enough titled as ‘Bali Maharaja Arrested,’ there is a fascinating discourse on the need for men to keep their word, and further on about the inevitability of the ‘time factor’ (destiny) and on the fickleness and futility of fame and riches. Thereupon he allowed Mahabali and his associates to go live in Sutala, where the most noble, most pious and most celebrated of people lived. It was no less than heaven but only more spiritual. Where one of the widely read and prevalent Maha Puranas, the Bhagavata, falls silent, the Malayalis took over. In Bhagavata, the tale of Bali ends with Vamana handing over the heavens to Indra. But as per Kerala’s own myth, Mahabali did not really go to Sutala. He was pushed down and banished to Patala (the under-world). Nobody wants to go there because it is the equivalent of hell. So why should our good lord Mahabli go? The King, according to Kerala’s own purana, traumatized by the turn of events was willing to go under but he had one request. Having tremendous love for his people, the Malayalis, he wanted one wish to be granted. Vamana granted him the boon, and the day he chose to visit his loving Malayali people was the day of Thiruvonam in the Chingam month as per the Malayalam calendar. Chingam incidentally also marks the Malayalam New Year. It suited the people, one must assume, because Chingam was the harvest month and if only for appearance-sake they would have enough grains to greet their former ruler. Malayalis went on to coin their own saying that even if you had zilch in your hands, sell everything and celebrate Onam. So it is that every month of Chingam (which varies according to the civil calendar) on Thiruvonam day, Malayalis anywhere in the world will celebrate Onam to welcome their good old king. While Kerala marks Thiruvonam to welcome Mahabali, the rest of India do not really subscribe to the Mahabali vs Onam story. As per other great histories of yore, such as Brahma Vaivarta Purana, Mahabali’s return is part of the elaborate Diwali celebration (putting forth the claim that Mahabali was not just Kerala’s king but the entire India itself; after all, as per the Puranas, Vamana meets Mahabali on the shores of Narmada, and hardly a tributary or rivulet of the great river reaches Kerala). Typically, it is third day of Diwali, known as Bali Pratipada when Mahabli, being granted the same boon that Malayalis wanted for themselves, visits his people across the country along with his wife Vindhyavalli. It might not be surprising that the name Vindhyavalli does not ring any bells among most Malayalis because she is not part the popular Malayali anecdotes about the king. Vindhyavalli’s soul-stirring prayer also elicits one of the most thought-provoking discourses in the story of Mahabali, as Vamana reminds of how material riches push people to sheer greed. Years have passed since these tales came into circulation. But Thiruvonam continues to be a proud traditional celebration of the Malayalis. What makes the festival endearing and popular is that it cuts through any religious connotations. Widely celebrated, it is almost like Kerala’s ‘national’ (pun intended) festival, where no matter who, what, where or why, people come together in joyous togetherness. While many would bemoan that Onam is being commercialised and that the essence of the festival has given way to loud, garish and ostentatious displays, the underlying theme of the festival – of a benevolent ruler and a land of plenty with no trace of falsehood continues to underline, perhaps, (Malayali) human’s quintessential search for Utopia. That is arguably why, every Onam also sees with the largest sale of alcohol in the state! 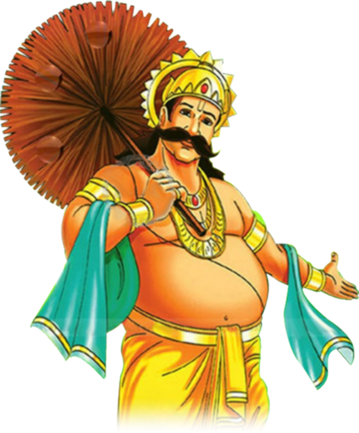 And Kerala being Kerala, with its plurality of views mixed with political mongering, do not be surprised today, as you see a section of the people, in a dilution of the non-religious and secular attributes of Onam, marks it NOT in memory of Mahabali but as ‘Vamana Jayanti’ – the birth of Vamana! Next From Inquilab to Amitabh: At 75, do we really know him?